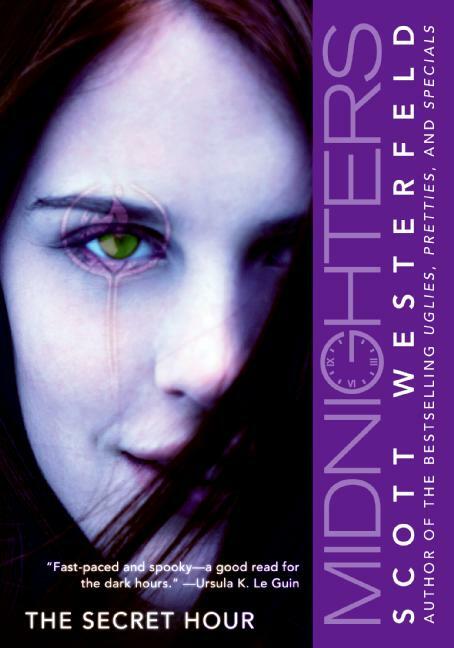 I just started a new series by Scott Westerfeld with Midnighters: The Secret Hour. I’m not much of a fan of fantasy, so I avoided this series for a long time. This book was written in 2004, long before I discovered Scott Westerfeld, but the idea of the series never grabbed me. After reading Extras, however, I was desperate to read something else just as good, so I jumped into this little fantasy world with my eyes closed and my nose plugged. Not only did I not drown, I was pleasantly swimming by the first chapter. Rex, Melissa and Dess are the outcasts of Bixby High School. The small Oklahoma town is a stifling blip of humanity in the dessert. When Jessica moves to town, she is immediately heralded as a popular girl. Fresh from Chicago, she has all the cool kids interested in her. Rex, Melissa and Dess are interested in her as well because they can tell she’s one of them. Bixby, Oklahoma has a secret. At midnight, the clocks stop and the world turns a frozen blue for Rex, Melissa and Dess. It is the one hour of the day where they are free to move. While the rest of the world is frozen in time for an hour, the three of them have known unprecedented freedom. Now that Jessica is here, their freedom is threatened for the first time in years. A little drama wins more friends than boring. Monsters, spiders, black cats, casting, spells, numerology and all that sounds like a horrible read for me, but Scott Westerfeld was able to make it relatively believable and instantly compelling. Within a couple of pages, I was hooked and after I consumed The Secret Hour in the span of a day, I bought the other two books in the series. If you are a fan of Harry Potter, you will love a more mature fantasy set in the rural United States. Enjoy!